Background: Our study draws on a sample of approximately 2,7000 respondents and in-depth interviews with 27 children of intermarriage in four cities. We compared children of intermarriage and children of inmarriage to identify which experiences and relationships are most likely to result in robust Jewish attitudes and practices in adulthood. The central finding of the study was that participation during college in Birthright Israel, campus groups such as Hillel and Chabad, and/or taking courses focusing on Jewish topics was life-changing in terms of respondents’ Jewish engagement. At the same time, participation in Jewish life during college was related to childhood experiences. As part of the study,survey respondents were asked open-ended questions about who had the greatest influence on their religious identities when they were growing up, and in what ways. About one-fifth of children of inmarriage and intermarriage mentioned grandparents as an important adult influence. We decided to look into this relationship further. In our survey, respondents were asked how close they were to their grandparents while growing up. For children of intermarriage, being “very close” to Jewish grandparents was an important predictor of a variety of Jewish attitudes and behaviors in young adulthood, including celebrating Rosh Hashanah and Passover, attending Jewish religious services, feeling connected to Israel, identifying as Jewish by religion, and believing it is important to marry someone Jewish, and raise Jewish children. This positive relationship between closeness to Jewish grandparents and Jewish attitudes and behaviors in young adulthood persisted even when we statistically controlled for childhood and college experiences and for the gender of the Jewish parent. However, children of intermarriage – especially when the father was the Jewish parent – were less likely than their counterparts with two Jewish parents to have had a close relationship with Jewish grandparents while growing up. Overall, it was more common to be “very close” to maternal grandparents than to paternal grandparents, and it was also more common to be “very close” to Jewish grandparents than to non-Jewish grandparents. These two phenomena work together to create a gap between children of inammariage and children of intermarriage with regard to their closeness to Jewish grandparents. Children of inmarriage were more likely than children of intermarriage to be close to at least one set of grandparents, and thus more likely to be close to at least one set of Jewish grandparents. 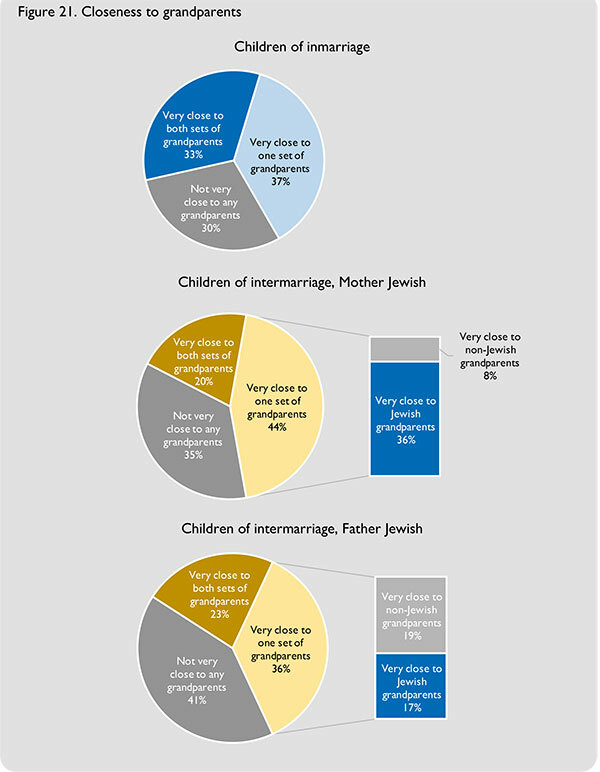 Similarly, children of intermarriage whose mothers were Jewish were more likely than children of intermarriage whose fathers were Jewish to be close to at least one set of grandparents, and more likely to be close to at least one set of Jewish grandparents. Closeness to Jewish grandparents helps to explain some of the disparities in Jewish engagement in young adulthood between children of inmarriage and children of intermarriage, and also between children of intermarriage with Jewish mothers and children of intermarriage with Jewish fathers. Policymakers should consider how we can leverage the influence of Jewish grandparents to increase the likelihood that children of intermarriage will have Jewish experiences when growing up. In addition, while unanswered by our study, the community should examine what role Jewish grandparents can play in supporting the Jewish journey of those who engage with Birthright Israel and other Jewish educational programs. Interesting results although not at all surprising (clearly baby boomers have taken “grandparenting” to an art form!). Based purely on anecdotal experience, I suspect that the trend you discuss will only intensify in the years to come as we see more children from Conservative and even traditional backgrounds (not necessarily Orthodox) intermarrying. Specifically, I would not be surprised if the grandparents of the children with Jewish fathers become more equalized in their closeness given the efforts these grandparents are likely to make to insure the transmission of some Jewish content to their grandchildren. I already see this happening with my friends in these denominational categories whose sons have intermarried. Another research report that confirms what we at Big Tent Judaism have known for a long time. This is what motivated is to establish Grandparets Circles all over North America. In our particular situation the grandchildren are very close with the paternal and maternal grandparents. They are being brought up with a Jewish education, but with some Christian holidays. Our situation finds the Father Jewish and the Mother Christian (but not practicing) The Mothers Circle and the Grandparents Circle extremely helpful. 1) Should we be putting greater emphasis on efforts to reach Jewish fathers in order to raise the percentages of Jewish connection and involvement of their children? Is such an effort a waste of time and resouces or is there a good chance to succeed? 2) Does the study prove that, once again, the mother is the ultimate decisor regarding religious/spiritual/cultural involvement and affiliation and that nothing we do will change this? In other words, 80% seems to be consistent in religous determination and involvement whether the mother is Jewish or non-Jewish. Given that reality, is there really anything we can do to effectively change this? 3) Regardless of the statistics, does this mean that perhaps the Jewish world should invest greater financial reasources in helping families with infertility challenges, where the mother is Jewish, to literally create more Jewish babies – see the incredible and courageous work of Annie and Rabbi David Glickman, founders of Priya, and Elana Bekerman who recently wrote in eJewishphilanthropy? 4) Should denominations invest greater resources, financial and human, in college students regardless of whether they are Jewish matrilineally or patrilineally as this seems to be the time that this generation starts making decisions on their own. “And you shall teach your children” doesn’t end when they are grown and raising their own children, as so many of today’s grandparents have found, and as this study demonstrates. Making sure the traditions continue is a responsibility we Boomers are taking seriously, and even more so if we have children who are in interfaith relationships or marriages. This often means making the choice to leave part of the family at home to travel to “the kids” to spend a holiday with them, to take the goodies out of the shopping bag like my own Bubby did, to help them make memories and support their Jewish choices. The community’s role is clear-we need to make every effort to be there for the Jewish spouse who is making that choice, whether it is the father or the mother, and offer Jewish family experiences which are easily accessible, inclusive, and worthwhile. Although our son was raised by two Jewish parents, went to Hebrew school since Kindergarten , was both bar mitzvah end and confirmed, was active in Hillel and birthright, he is living with a non Jewish mate. He dated hundreds of jdate girls over 4 years. They have an infant and are not committing to bring him up as a Jew. Our son though bright was very ADHD.and dyslexic He now says he hated every minute of Hebrew school. He said the teachers were mean, made fun of him and his classmate bullied him. He hated being there and had no love of being Jewish. Both sets of grandparents were close to him and we had family Jewish holidays. I think formalized religious education has to change and create love and warmth and a huge connection to what being Jewish means for students with learning disabilities. In my son’s case, his early learning abuse which we were not aware of at all, left an indelible impression of his being rejected as a damaged person and not a child welcomed into the tribe. Something should be done to make Jewish day schools and JCCs more affordable. Catholics manage to do so for their parochial schools, but our Jewish schools are priced like college. I’ve tried to help, but even so, there should be reasonably priced ways to bring them into the Jewish fold.